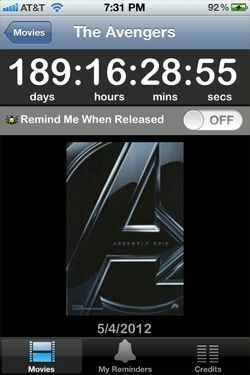 Miami, Florida - Movie Clock for iPhone is a free app available on the iTunes app store that helps you countdown to your favorite Hollywood blockbuster releases. Set individual alerts for each movie to be alerted when they are out in theaters. Developed by Mediaspree LLC in conjunction with FlickDirect Inc. Movie Clock has an extensive and automatically updating movie database with release dates for movies until summer 2013. When tickets for your favorite movies become available, Movie Clock lets you be the first to purchase tickets through a business relationship with Fandango.com. Movie Clock Free 1.2 is free and available worldwide exclusively through the App Store in the Entertainment category. The FlickDirect(TM) online website is owned by FlickDirect, Inc. FlickDirect(TM) carries a wide assortment entertainment news, information, video clips, reviews, and interviews from the popular to obscure motion pictures and television. FlickDirect is one of the online leaders in entertainment social news, theatrical/home Entertainment reviews and television reviews. FlickDirect is strategically partnered with various studios and provides exclusive content to its visitors. Guests may also get local movie tips, and win prizes by following FlickDirect on foursquare. Copyright (C) 2011 FlickDirect, Inc. All Rights Reserved. Apple, the Apple logo, iPhone, iPod and iPad are registered trademarks of Apple Inc. in the U.S. and/or other countries.